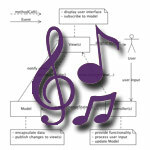 This week on Musical Geek Friday - the Model View Controller (MVC) song! This song was written and performed by James Dempsey, an engineer at Apple. James says that he searched iTunes for a model-view-controller song but there was none, so he wrote his own song about this topic. The song is about a particular Design Pattern in software engineering. A Design Pattern is a simple solution to a specific problem that occurs very frequently in software design. The MVC Design Pattern was first discovered and described by Smalltalk people (see the original paper). This key idea of this pattern is that it decouples data to be displayed (model) from the code displaying the data (view) and code receiving user input (controller). The problem is that the song is NOT about Smalltalk MVC. In this song, the controller is a layer between the view and the model, which usually means it is a mediator. The song also says that the controller is copying values from one field to another, which also indicates that it is a mediator. However, in true MVC, the controller is a strategy for handling events. The events come directly to it, rather than to the view. The controller changes the model, but it is not notified by the model. When the user presses a key or moves the mouse, the controller receives the event. It checks with the view to map mouse locations into model coordinates, then interacts directly with the model. If it changes the model then the model notifies all dependents (observers), which notifes the view, which redisplays. The song desribes Ivar Jacobson's Model/Interface/Control, in which the Control is responsible for an entire use case. It is not MVC. Jacobson's model is like the MVC model, but his Interface is a combination of View and Controller and his Control is not at all like a real Controller. Model View, Model View, Model View Controller MVC's the paradigm for factoring your code, into functional segments so your brain does not explode. To achieve reusability you gotta keep those boundaries clean, Model on the one side, View on the other, the Controller's in between. Model View - It's got three layers like Oreos do. Model View creamy Controller Model objects represent your applications raison d'tre. Custom classes that contain data logic and et cetra. You create custom classes in your app's problem domain, then you can choose to reuse them with all the views, but the model objects stay the same. You can model a throttle in a manifold, Model level two year old. Model a bottle of fine Chardonnay. Model all the twaddle stuff people say. Model the coddle in a boiling eggs. Model the waddle in Hexley's legs. One, two, three, four. Model View - You can model all the models that pose for GQ. Model View Controller View objects tend to be controls that view and edit, Cocoa's got a lot of those, well written to its credit. Take an NSTextView, hand it any old Unicode string, the user interacts with it, it can hold most anything. But the view don't knows about the Model: That string could be a phone number or the words of Aristotle. Keep the coupling loose and so achieve a massive level of reuse. Model View - All rendered very nicely in Aqua blue Model View Controller You're probably wondering now. You're probably wondering how, the data flows between Model and View. The Controller has to mediate, between each layer's changing state, to synchronize the data of the two. It pulls and pushes every changed value. Yeah. Model View - mad props to the smalltalk crew! for Model View Controller Model View - it's pronouced Oh Oh not Uh Uh Model View Controller There's a bit more on this story, a few more miles upon this road, well nobody seems to get much glory writing controller code. Well the model is mission critical and gorgeous is the view, But I'm not being lazy, but sometimes it's just crazy how much code i write is just glue. And it wouldn't be so tragic, but the code ain't doing magic: it's just moving values through. And I wish I had a dime for every single time I set a TextField's stringValue. Model View - how we're gonna deep-six all that glue Model View Controller Controller's know the Model and View very uahh - intimately They often are hardcoding which is very verboten for reusability. But now you can connect any value you select to any view property. And I think you'll start binding, then you'll be finding less code in your source tree. Yeah I know I was astounded, that's not even a rhyme. But I think it bares repeating all the code you won't be needing, when you hook it up in IB. Model View - it even handles multiple selections too Model View Controller Model View - hope I get my G5 before you Model View Controller Yeah, yeah, yeah. Yeah.